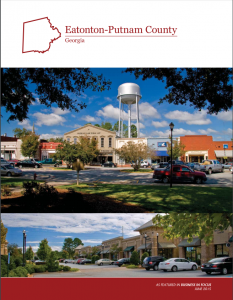 In an effort to match the demands of employers with skilled job-seekers, the Middle Georgia Consortium is partnering with the Putnam Development Authority to create a funding package to help local residents with job training. Business Service Specialist/Grant Writer Amy Varnum and Janie Reid, career facilitator for Work-Source, gave a presentation June 12 to inform PDA board members of opportunities available through the Consortium to help with workforce development. “What we have to offer is Workforce Development dollars,” said Varnum, noting MGC is trying to build a package to go into businesses, either new businesses or old businesses, to make it more attractive when economic development partners go out to bid for companies to bring business to Putnam County. States are restricted in what they can do with tax incentives, but MGC can actually pay the company to hire people by paying them to train. Using Incumbent Worker funds, WIOA allows local boards to use up to 20 percent of their adult and dislocated worker funds to provide for the federal share of the cost of providing training. Designed to meet special requirements of an employer to retain a skilled workforce, through the WIOA, Varnum explained Consortium representatives have the ability to help job seekers access employment, education, training and support services to succeed in the labor market and to match employers with the skilled workers they need to compete in the global economy. Employers participating in incumbent worker training are required to pay a “match amount,” which is the non-WIOA (non-federal) share of the cost of providing training to their incumbent workers. Previously geared more towards the individual, a law passed in 2014 at the federal level moved that money more toward workforce development, which means more businesses can get involved. “As more businesses get on board and maintain a flow, economic development authorities will be able to go into a business and be creative enough to mold what that business needs to fit the funding stream,” said Varnum. With a lot of county crossover, as some residents who live in other counties may work in Putnam and some Putnam County residents may work in other counties, qualification for funding is based on the resident, not the company. Concentrated primarily to skilled positions, the company has to have been in business for at least six months and can’t have laid-off any employee for at least six months. Explaining how the procedure works, Varnum said, for new-hires if someone is qualified, the company can get up to half the training wages reimbursed. Varnum said the Consortium uses a department of labor tool, which gives job descriptions, along with work skills and abilities for a position then gives a code which advises how long to train for that position. Noting that the program would benefit several local companies, Sharp mentioned Vizitech, which is a new business in Putnam County. “This is something I think they would be interested in because they are growing,” he said. “And if it takes eight months to train, with a 50 percent reimbursement, that is a chunk of savings, especially for them because they are very high-paying jobs,” said Varnum.